Christmas came early this year. 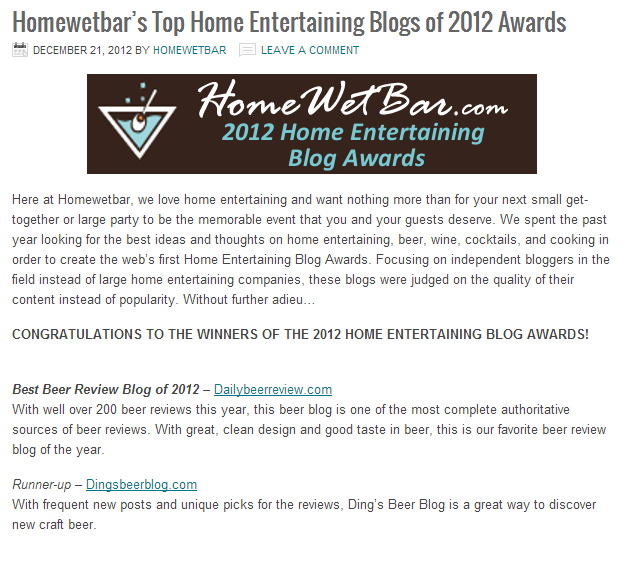 HomeWetBar.com named DailyBeerReview.com the Best Beer Review Blog of 2012! Of course you already knew that though, right? Shhh, you! Anyway, what I suggest you do is sign up for new content delivered to your desk/phone a few times a week to enjoy with your cafe mochachino latte grande. The end. How's that for a short entry? Congrats, Rob! I'd like to think my review had something to do with it. No doubt about it, Vinny! Weren't you working on another one? The guy from HomeWetBar that told me I won is actually going to do a few guest reviews from small breweries in Queens. Thanks, Tahira. You're still my favorite! I saw the news yesterday but that is awesome. I love who the runner up is too haha. Runner up is better than winning. DING is the killjoy of everything enjoyable about American beer culture (and I'm sure he's very proud of that, too). I'll leave it at that. Have a lovely time during the holidays!